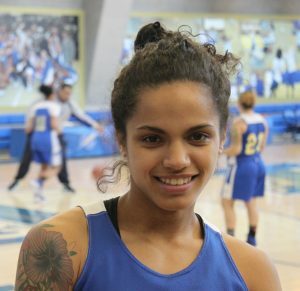 Amely Del Rosario, Lehman’s 5’5” powerhouse guard, is considered one of the greatest basketball players in the history of the College. Her stellar athletic career could fill several highlight reels—though it is a career that concluded a few weeks ago, when the Bronx native’s attempt to lead the Lightning to its second consecutive CUNYAC tittle ended with a loss to the College of Staten Island. However, despite the defeat, her time at Lehman has been one for the record books—including appearing in both Sports Illustrated and Newsweek. Some of Del Rosario’s career highlights include scoring more than 2,000 points, the second leading total in the school’s women’s basketball history; leading the Lightning to the 2016 CUNYAC Championship title—the College’s third championship; getting named 2016’s CUNYAC Tournament MVP; leading the NCAA Division III in scoring during 2015-2016 season (23.3 points per game); leading the CUNYAC in scoring during the 2016-2017 season (23.4 points per game); getting named a CUNYAC two-time First Team All-Star and one-time Second Team All-Star; picking up the ECAC Metro Region and CUNYAC Rookie of the Year Awards in 2013-2014; and setting a Lehman record with 48 points against Hunter College in 2016. Ironically, Del Rosario was never considered a top prospect at John F. Kennedy High School in the Bronx, nor did she ever believe she was more than a capable backup until she arrived at Lehman. At Kennedy, she was a part-time player averaging just six points per game. However, at Lehman she emerged as a star. She credits the transformation to Lightning Head Coach Eric Harrison’s ability to unlock the talent that elevated her into the top tier of Division III players. “Coach saw that I could be a different sort of player than what I was at Kennedy, and he exposed a lot of talents I didn’t know I have,” she said. The respect goes both ways. As a freshman, Harrison encouraged Del Rosario to “attack the basket” and helped unleash her shooting prowess from beyond the 3-point arc. She also gradually developed into a more unselfish player, with a dramatically improved passing game. During her career, she blossomed from shy freshman to confident team leader. Her biggest fan is her mother, Olga Garcia, who has attended most of her daughter’s home games. Through the years, she’s also drawn professors, classmates, and friends to watch her high-level performances. Del Rosario is optimistic that she’ll get a shot at tryouts with professional teams either in the United States or abroad. She’s an ardent admirer of All-Star WNBA talent such as New Yorker Sue Byrd (Seattle Storm), Maya Moore (Minnesota Lynx), Seimone Augustus (Minnesota Lynx), and Diana Taurasi (Phoenix Mercury). As a 5’5” guard, Del Rosario relies on her speed to “get to the basket easier and get by players faster.” While she admits that being on the court with women more than 6’ feet tall can be intimidating, she’s confident enough to believe that she can hold her own with even the most towering opponenets. That’s in part due to her strong work ethic, and the dedication of the Lightening coaches who have worked hard with Del Rosario and her teamates. In the offseason, Del Rosario spent as much time in the gym as possible, working in the weight room, on her cardio routines, and in the pool.